Edited by Fragata_Odin, Oct 23 2016 - 15:36. Your image seems to be broken Try reuploading it to imgur again or just include it as an attachment if possible? ​Pronto!! veja se está funcionando agora, por favor. Ready!! see if it's working now, please. 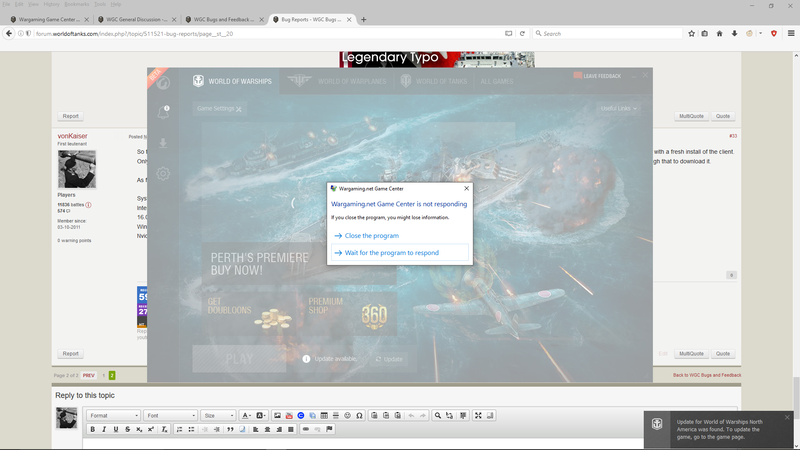 "The program would remain forever stuck at the importing games screen"
I did see this early Oct, I have not been able to reproduce now and import works fine on Win 7 and Win 10 computers. That's the issue I had when I first installed WGC though closing the program down and re-downloading it fixed it for me. Starting to see Lag issues with an increasing frequency. Have been "booted" four times yesterday and three so far today. No one else playing has the issue. I am on a wireless router one room from the router location.. Two other folks normally play as well but I am the only one on right now and just got removed agter lagging badly. Tried the computer and router restarts, but did not help. Anyone else seeing this? Previous issue with lag seems to have cleared up. Perhaps a fluke of the past couple of days for the local connection. Not sure if this is WGC related or not, but last night my WOWS tech tree dropped out of my client. The page was there, but no ship images, for any nation. Being pretty sure it's a local client issue, I tried to run the WG checker, which would not run, because it couldn't find the standard launcher. I found the WGC checker, and ran it. It found some problems, and even downloaded some missing files, but the Tech Tree is still missing. Tried again this morning, same thing. Checker ran fine, still no Tech Tree. I am going to play around with DNS settings later tonight, and if that doesn't work, re-install. Please submit a ticket to support, and be sure to attach the check tool output file to your ticket. Second, I resolved my problem with a reinstall, but then discovered it was caused by a Mod. As soon as I reinstalled Aslain's mod-pack, the tech tree disappeared again. 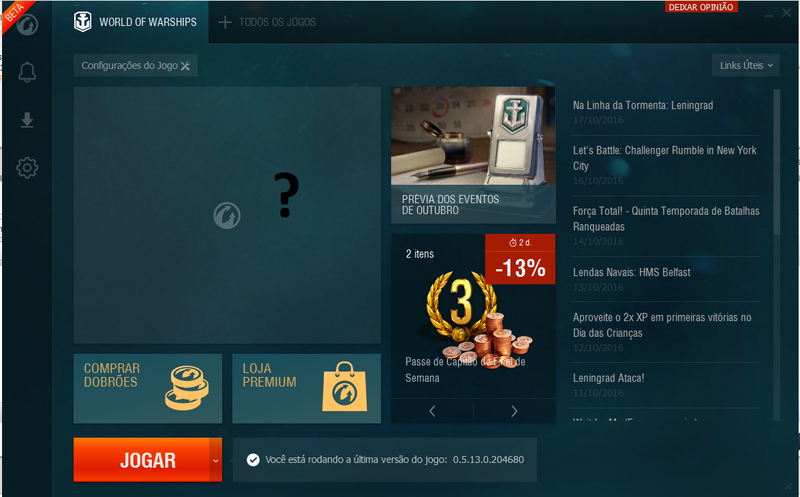 I reloaded the game in "non-mod" mode from the launcher, and it fixed it. I use about 10 mods, (but, interestingly none are tech tree related) so I am now going through the list and re-installing the mod pack to find which one it is. I'll report back here. Also, as soon as the "Official Mod-pack is updated to current patch, I will try that as well. Although this isn't related to WGC, I've had that problem before as well. One of my mods, that was actually supposed to be compatible with the game version, was causing BSoDs for me, so yeah, mods are pretty messy. So far the only issues I've been having is randomly black screen and the 'not responding' error in the task manager. 2 times so far. 1st time was solved with a Java update. Second time was solved with a fresh install of the client. Only other drawback is when the launcher is un-installed the regular, non-beta launcher is no where to be found in the folder. Which is fine, up until a new patch comes out and you have to go through that to download it. As far as recreating the bug, well all I did was not run my PC for a few days. Darn work taking time away from my fun lol. 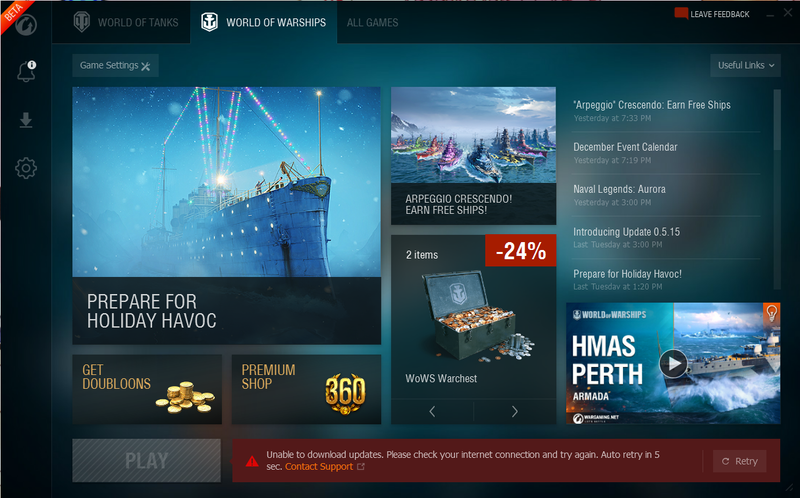 Well, been about 6 days since I've had the chance to log in. Opened up the launcher and, while not a blank screen, doesn't respond and won't load up. Mine does the same thing But i had to download the full game once and had it installed and played it but then the next day it wanted me to download the whole 12GB again And now it says that it is the current version is installed but it is waiting for the current version to be installed. The 0.5.16 update video fails to play. Sliding the mouse along the time line shows the video images but the video will not play. 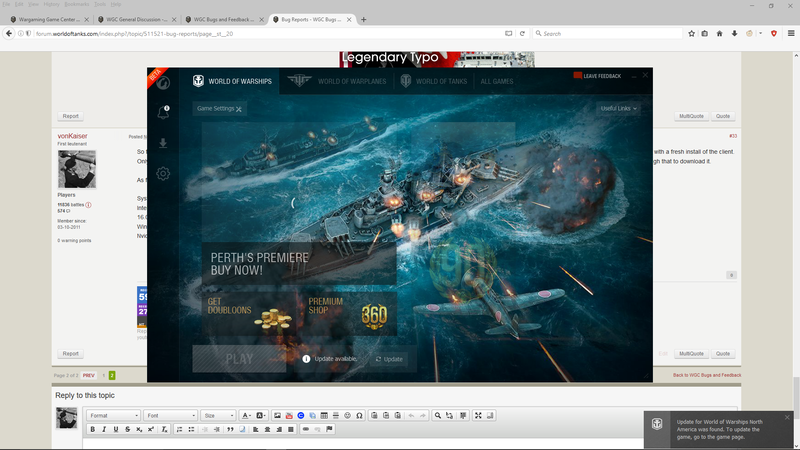 Click on News Article "World of Warships Update 0.5.16 with Dasha". After the article loads click the 'play' icon to start the video. what is the proper way to report all my logs and stuff? Not sure if you are still looking at the bug reports. I am running v 16.00.00.1062 of Game Center. I uncheck the box to "Launch Game Center when you start your computer" andit fails to honor that selection. Game Center opened when my system was restarted. Uncheck box "Launch Game Center when you start your computer"
Note that Game Center opens at startup. Edited by 80_proof, Jan 07 2017 - 14:03.